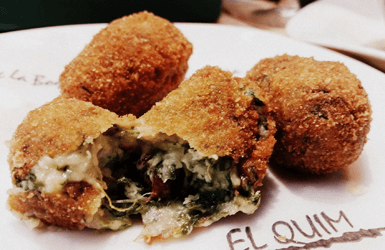 Enjoy Las Ramblas with all your senses – including taste, finally! Las Ramblas are one of the main arteries of Barcelona and a well-known place that you shouldn’t miss. This 1.3km long street connects Plaça Catalunya with the old port and it’s always crowded: people walking, artists, music and terraces that makes this place a good choice for wander around. Enjoy it with your eyes people-watching, enjoy it with your smell when you pass by the flower market, enjoy it with your ears with the rejoicing of kids and adults being surprised by the living statues tricks, enjoy it with your touch gently caressing the bark of the hundred-year-old plain trees along it. And yes, enjoy it with your taste… if you know how to avoid the tourist traps and the fast food venues. Impossible? Not really! Among all the available food options, here are the ones we like the best and won’t fail you. This brasserie offers a very Mediterranean proposal all day long: from morning to night. There are delicious salads, tapas, pasta, sandwiches and pizzas… all elaborated in their open kitchen with a real wood oven. The service is quick and the decoration, with wood and neutral colors, make it the perfect haven of peace for charging batteries and feeling like home. 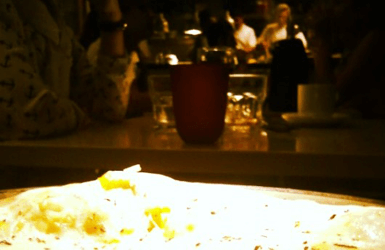 Don’t miss their leek and truffled egg pizza – amazing! And if you can, get a table upstairs and be surprised at the stunning giant paper dragon that hangs from the ceiling (they kept it from when the venue was an Asian restaurant before becoming Luzia). If you don’t want to waste too much time in a restaurant, then I would suggest to try Viena’s sandwiches. Viena is a local fast food chain but they offer delicious sandwiches with high quality raw material. They totally beat the burger places you are used to. Plus it’s open all day. If you want to have lunch or dinner, you can accompany their sandwiches with salads and french fries, and for dessert they have pastries and even a cake of the day. Their Jabugo ham sandwich has been mentioned in international press, and Barcelonans rave about the Alpino sandwich (yummy sauce!) and the cheesy Cevapcice sausage. They also have some good options for vegetarians and gluten-free diets. In the evenings, people attending the shows in the next-door theater come here for a bite – maybe that’s why there is a grand piano decorating the access to the toilets upstairs… A good choice at a reasonable price. This restaurant located at the bottom of Las Ramblas (near the Columbus monument) is a classic in the city and probably the oldest restaurant in the street. It offers a fusion of Mediterranean and Basque cuisine, and all dishes are cooked with fresh and good quality products. You can choose between being seated at the terrace, the lounge or the attic. Good choice to rest and enjoy without paying much attention to the clock, specially if you like good old earthy recipes: honey-coated lamb shoulder, hake in green sauce… Traditional food and a great atmosphere. We probably shouldn’t call it strictly a “las Ramblas restaurant”, because technically it’s not exactly located in Las Ramblas but just off it, in the lively Plaça Reial. It’s a multipurpose fun space that changes from day to night: a cafe in the morning, an outdoor terrace when the weather is good, a restaurant during meal times, a club with a lot of rhythm in the evenings… I offers a simple but original cuisine and tapas inspired in the Catalan tradition with some Asian and Moroccan fusion touch. Don’t miss either their cocktails, created by the international barman Mario Greenfield. Ocaña will surprise you, and you’ll understand how it was managed to attract Barcelonans back to la Rambla, when most locals had stopped coming after the explosion of tourist traps. By the way, the venue decoration inspired in the sixties links to the name of the place: Ocaña was a famous transexual artist that lived in this plaza and organized performances way beyond his time. AND BONUS! Want to discover the newest opening that is going to transform la Rambla restaurant scene? This industrial style restaurant, huge, modern and full of colors and live music, offers a good variety of tapas and Mediterranean dishes. Choices range from grilled squid caught in the local beaches to tuna tartare, baked lamb to paella, and they have also handmade pizzas and gourmet burgers among other things, but tapas is what they are most proud of. It also has a “show cooking” kitchen where you can see how they prepare ceviche, oysters, shrimp and other assorted canapes. A new and fun option that might be worth trying. So what about you? Head to the comments below and tells us: any other las Ramblas restaurant that you’d recommend?